In order to check the continued abstraction of ground water leading to severe depletion of ground water resource in the National Capital, the Lt. Governor of Delhi has issued an order, through the Dept. of Environment, GNCT, that no person, group, authority, association or institution shall draw ground water through bore-well or tube-well (both new as well as existing and drawing ground water without permission of the Central Ground Water Authority) for domestic, commercial, agricultural and/or industrial uses. Only after a prior permission from the “Competent Authority”, which could be the Delhi Jal Board (DJB) or the New Delhi Municipal Council (NDMC) is obtained, can the ground water be drawn for use. The order, under Section 5 of the Environment (Protection) Act of 1986, also promoted ground water recharge by laying greater emphasis on rain water harvesting (RWH). Those seeking permission for drilling a bore hole for a building plot size greater than 200 sq. meters, the permission shall be granted subject to the condition that the occupier shall install a RWH structure in the building. Permission seeked for commercial or industrial uses shall also require, in addition to the RWH, reuse of water in horticulture or cooling or toilet flushing or any other similar suggestion given by the concerned Advisory Committee. Genuine agriculturists in the capital can obtain permission for setting up tube-wells from the Advisory Committee under concerned Deputy Commissioner (Revenue) based on the recommendations of Block Development Officer and Agriculture Department/ Irrigation & Flood Control Dept., GNCT. The Order is timely and required, at a stage of urban development when there is tremendous pressure on the ground water resource in Delhi. Any violation of the stated directions are punishable under Section 15 of the Environment (Protection) Act, 1986. However, implementation is both the key as well as the limiting factor when it comes to enforcing such laws where the utmost indirect significance is not properly understood by the masses. That would be the greatest challenge in this case as well. Water is essential to people and the largest available source of fresh water lies underground. Groundwater is water located beneath the ground surface in soil pore spaces and in the fractures of lithologic formations. Increased demands for water for drinking as well as urbanization purpose have stimulated development of ground water resources. But it is difficult to understand the pressure on this resource as it exists away from our sight, down below. While non-functioning hand pumps and increasing depth of bore holes are instanced experienced by some of us living in Delhi, there is no real appreciation of this deepening water crisis. There are reports now being filed on the depleting quantity as well as quality of Delhi’s ground water and concerned individuals working to prevent the South and South-west districts of Delhi from becoming a desert. This Order, if properly implemented, would indeed go a long way in ensuring a sustainable water availability for the NCT and an overall sense of environmental security for the capital. There is rampant misuse of ground water by several people in the residential colony Jangpura-A, New Delhi-110014. The same is done under the the very eyes of Delhi Police, DJB, CGWA and MCD. The bore wells are dug by builder mafias outside the plotted houses on MCD lands, be it jet pumps or submersible pumps.The water is used for feeding unauthorized building floors (up to 5th floor) on plot areas of 83.61 sq mts. The owners are not using DJB water and sell water to tenants on these plots including establishments several flats built on grabbed public toilets merged with Govt land. This is creating vote banks/ unearned money and depletion of water table. As water is ‘free’ from these bore wells, it is used for car washing-road washing etc. The LG is also a helpless fellow as the whole system supports the cheats, the Govt does not wants to govern and we are a gutless race will never see reason that all will sink in desert after few years. NOTHING CAN BE DONE NOW. It is too late. DJB has to recover several lacs from individual users in colony but are helpless as the cheaters are digging new bore wells and not paying a penny to DJB. People have made construction in double storey quarters 28 sq yds into 6 floor residential complex by merging gali, footpath of 7020 sq ft and now earning rentals of millions each year, water is free for these establishments from unauthorized bore wells built with connivance of all yet on Govt lands. No body bothers. It looks like all institutions of control are farce. In Ghaziabad max. 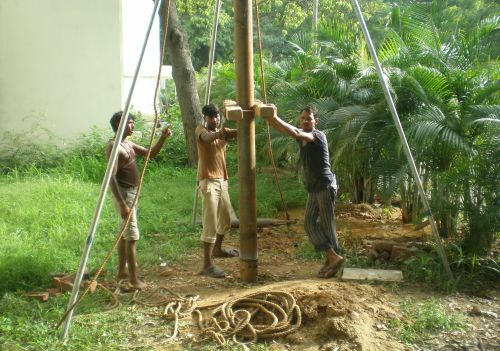 house owner are digging the ground for taking water from the ground by the help of submersible pumps. No body bothers, in this way water level are count. decreasing . Pl. tell me where to report about it ? Can ground water ( submersible ) be used for agricultural purposes? Where can we obtain the permission for this , if allowed? For obtaining permission for are falling under NCT of Delhi, you have to approach the Department of Environment, Government of NCT of Delhi in the Delhi Secretariat. The permission can be obtained from the local municipal office. I applied for Water connection for my flat in Delhi. In the meantime I was using water from Submersible. DJB rejected my applications due to some paper work. Now I am applying for the connection again but in the meantime they sealed the use of Submersible water. I have no water to use. I have no option but to get submersible water opened till I get new connection. What is the penalty for using that submersible water after opening the seal?